Let's not forget, it's also the most exciting time of the year! Halloween is just around the corner, followed by Christmas, Boxing day and New Years. With all these festive holidays on the way, brands are pushing out more content than ever. Which begs the question, how do you get noticed amongst all this chaos? Short on ideas? Lets have a look at the top scoring brands and what they did to reel in success around their Q4 campaigns in 2017. The most successful and notable campaign of the quarter in 2017 was Air New Zealand's "Mirry Christmus" Facebook post with over 70 thousand impressions. So what exactly caused the success behind this charming masterpiece? Entertainment - The post was highly amusing and relatable to the New Zealand audience. The incorporation of the Kiwi accent mixed with the use of humour created a content piece which the Kiwis loved. Incentives - Santa was doing a giveaway! Or maybe Air New Zealand was, we're not too sure. Consumers who engaged with the post had the chance of receiving one of the few mis-made toys from the video. ASB bank was second in line with a successful Facebook post which achieved over 10 thousand impressions. The Facebook post also embraced the holiday spirit via a facebook competition. 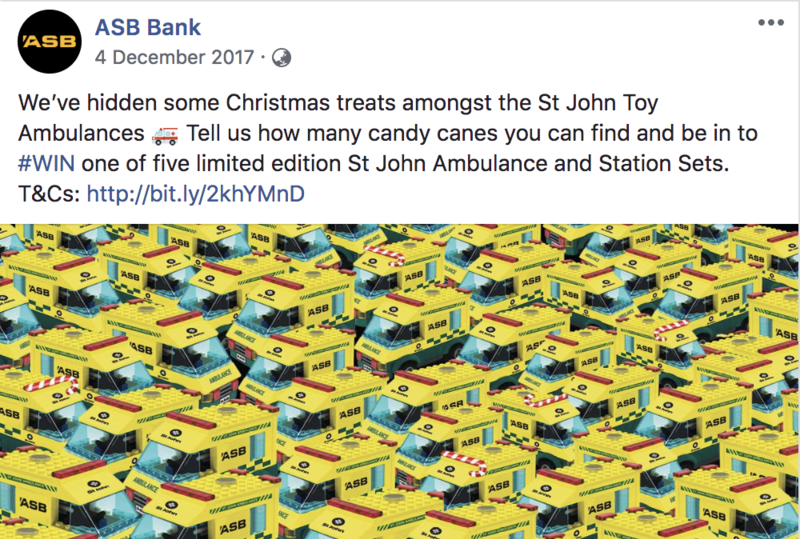 Consumers were asked to comment the number of hidden candy canes they could find in the picture provided in return for a chance to win one of five limited edition St John Ambulance and Station. The secret to its success is its simplicity- The post is simple to understand and fun to engage with. Encourages conversation - All that is required of you is to note down the number of candy canes you see, getting people to get in there and comment, discuss and agree with one another. Incentives - In return for your engagement you have a chance of winning a prize - and who doesn't love freebies? The Warehouse also had a facebook competition of their own! This one was targeted at all the Harry Potter fans, and judging by the 1.4k likes and 5.3k comments, it seems that there are plenty of them. The success points we've noted from this post are very similar to the others. Incentives! - This one seems to be a recurring theme, and a successful one too. 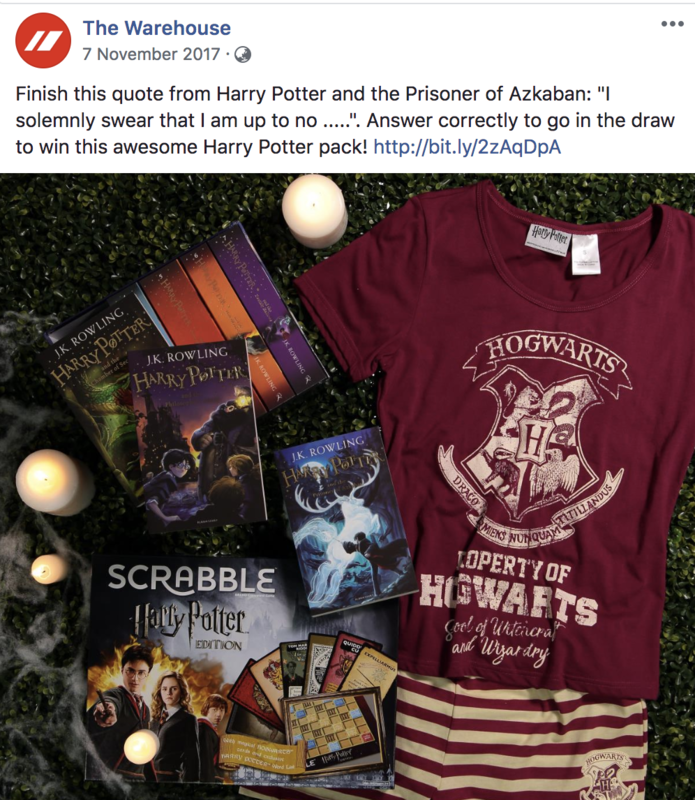 Consumers who correctly answered this question got to go in the draw to win the Harry Potter pack which was pictured in the post. Simplicity - Yet another simple post which didn't require much effort. Consumers had to simply finish off the quote to go into the draw. Sounds like a good deal to us. Use of relevant imagery - By simply looking at the post, all Harry Potter fans are immediately reeled in. I mean come on, it's pretty cute right? 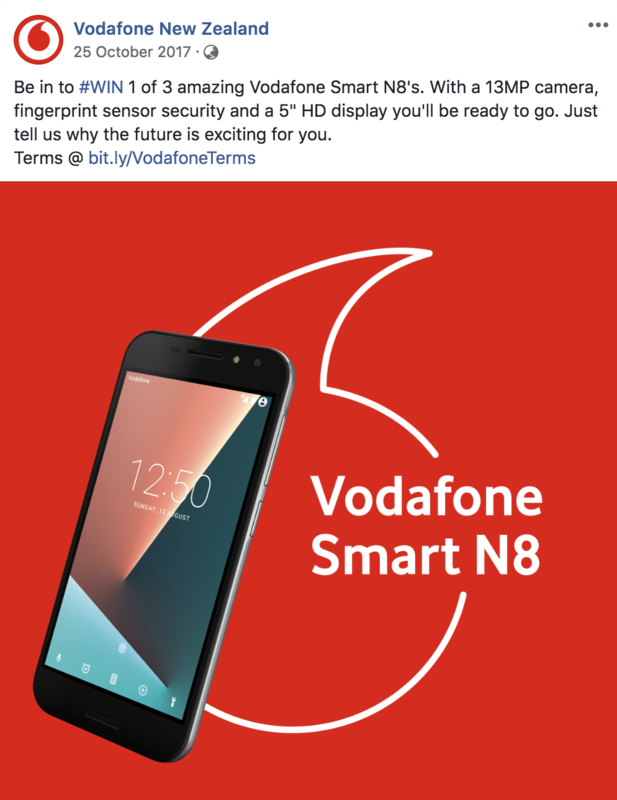 And last but not least, Vodafone did an amazing job with a HUGE Facebook giveaway offering engaged consumers a chance to win 1 of 3 Vodafone Smart N8's. This post gained 5.1k likes and 2.6k comments. This post, although very similar to the other social media marketing tactics, required consumers to think outside the box and get a little more creative. Maybe this was the reason that it didn't achieve as much engagement as the other two. The incentives offered in this post were much larger than the previous incentives and there were three chances to win! So there you have it, the top 4 most successful posts of the fourth quarter of 2017. We hope that these have provided some insight as to how these best practises can be applied to your own work, and who knows, maybe our next blog will be on your successful content piece! Want to know who is owning the hot topics on SM at the moment? Check out Zavy now!